After visiting my parents I stopped to see my good friend, Holly and her family in Durham, Maine. We have been friends since middle school. We grew up in a small town in Maine living less than half a mile from each other. She is now a seasoned Nurse Anesthetist (she makes a living putting people to sleep!). She and her husband raised three very beautiful and polite children in a gorgeous home located on a river that I refer to as a lake based on its size. When I visited she took me to her children's school where her youngest boy and his grade were parading with their costumes (most were amazingly creative). Her son was dressed as a ninja. I thought that was exciting since I have never experienced this when I was his age. Holly had some moose meat in her deep freezer that she shared with me. I was happy to just have a tiny piece but she ended up giving me 3 frozen bags. She received the meat from her hunter brother-in-law. While I was there I had a peek at her pantry to see what I can do with some of the meat. I sauteed the ground meat with some onion, parsley and added store bought jar of tomato sauce that I found. Her adventurous 8 year old daughter has never eaten moose before but seemed excited by the prospect of eating it. Since I have never eaten moose either I had a little taste. The meat is not at all gamey. It was tasty and lean as I had suspected. After I left, Holly said she made pasta shells, pour the moose sauce over them and sprinkled grated Parmesan cheese on top. She said it was "delicious". 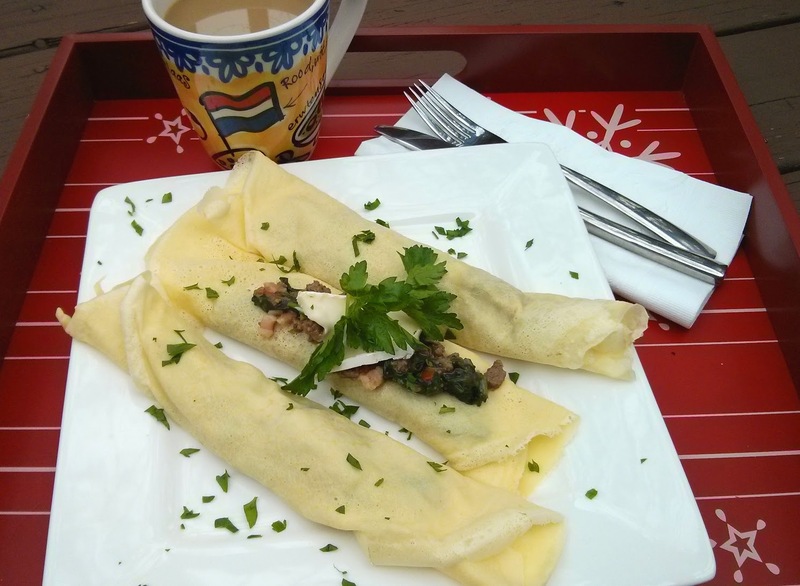 When I got home I came up with the idea of using ingredients that I like in a savory crepe. So here are my moose crepes! Perhaps next time I visit Holly and her family I can make this for them. Thank you Holly and family for the tasty meat! 1) Pour milk into a medium size bowl. Stir flour in slowly while whisking to blend the ingredients together. Stir in the beaten eggs and salt. Cover and let the crepe batter rest in the refrigerator for about 10-15 minutes before using. *I find that it is best to make the batter first and let it sit while I make the filling. By the time the filling is done then I can use the batter. 1) Heat a medium size pan over medium high heat. Once the pan is hot add oil. 2) Add garlic and onion. Saute for about 30 seconds to a minute or until onion is translucent. 3) Add pancetta and saute about 30 seconds. 4) Sprinkle in moose meat and cook about 2 minutes. 5) Add tomato and mushrooms. Stir occasionally for about a minute. 6) Add 1/2 of the spinach. Once it is slightly wilted add the rest. 7) Add salt to taste, a pinch of black pepper and half of the parsley. 8) Add cornstarch and water mixture, stir a few times and turn heat to low. This will help thicken the filling a little. *You can roughly portion the filling out (while it is still in the pan) so you can have an idea of how much you want in each crepe. This way your crepes will have roughly equal amount. I saved a little bit of filling to add to the top of my finished crepes for presentation. 1) Heat the pan over medium high heat. Grease the pan as needed (I normally dab a piece of paper towel with olive, vegetable or canola oil to grease the pan). 2) Once the pan is hot, stir the batter a few times to blend all ingredients and add a ladle (about 4 tablespoons) of batter in the pan. Use your wrist to swirl the pan quickly to spread the batter. Any extra batter in the pan can be pour out of the pan and back into the batter bowl. Cook for about a minute. Either flip the crepe gently or cover the pan and cook for another 30 seconds to a minute. Spoon the Moose Crepes Filling (see recipe above), add cheese (I added 2 thinly sliced brie for each crepe) if interested and roll or fold the crepes (in half or quarters). Repeat the process until all the batter is gone. If your batter gets too thick then add a little more liquid (~1 to 3 tablespoons) to help thin it out. 3) Spoon a little of the filling on top of the finished crepes and sprinkle chopped parsley over them if interested. *Once you have made a few crepes you can estimate how much batter you will need for each one. Initially you can pour the batter into a small container and use this as your measuring device for consistency. I normally use a ladle. *The initial crepes may not look so good but they are still tasty so don't discard them! You can pour your filling on top and eat them! Also, if your crepe is not perfect, roll the worst looking side first and no one except you will know about the imperfections. *I tend to cover my crepes instead of flipping them to cook the other side. *I like crepes because they are so versatile. I can use the same batter to make both savory and sweet ones. With sweet crepes I add a little sugar to the batter. I find that I can make nice thin crepes using a regular non-stick pan. However, I have a crepe pan and it also makes beautiful thin crepes. You can use a crepe stick to spread the batter--just be gentle and quick when you are doing this. It does take a little practice to make round thin crepes. Another easy way without the crepe stick is using your wrist and swirl the batter to coat the pan quickly. It works great and you do not have to spend the extra money on this tool. *I normally use all-purpose flour to make my crepes. However, one day I ran out of it and substituted cake flour since that was available in my kitchen. Maybe there is some subtle differences but honestly I cannot tell. This time I used whole milk for my batter. In the past I have used 1%, 2%, skim, and low fat milk. You can probably use soy milk but I have never tried. This time after making my first crepe I ended up adding 3 more tablespoons of milk to get my batter thinner. You can make more crepes by doubling the ingredients in this recipe. This recipe (batter and filling) is enough for 2 people.